Club Rossie works with Businesses to develop Gaelic Games in the county while also giving them a wide range of promotional benefits and the opportunity to win some great prizes. This process forms the basis for Club Rossie Business Membership, which also includes the option to display a sign in Dr Hyde Park for 3 or 5 years. 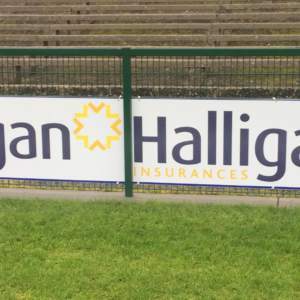 One of the highlights of Membership is the chance for a Business to see the Logo on the Senior Football Team Jersey for an Allianz Football League game. This year the “Jersey prize” will be for the home game against Kerry on March 24th!